With UFC lightweight champion Khabib Nurmagomedov’s suspension finally revealed during last weeks commission meeting, plans for the short-term future of the lightweight division can now begin to materialize. Nurmagomedov will be suspended for nine months retroactive to October 6, and it has been reported that he is eyeing a return to competition in November at Madison Square Garden. The man whom Nurmagomedov defeated to win the championship, however, Al Iaquinta is inching closer to a rematch against Nurmagomedov and is currently ranked #4 in the world according to the latest published rankings on UFC.com. 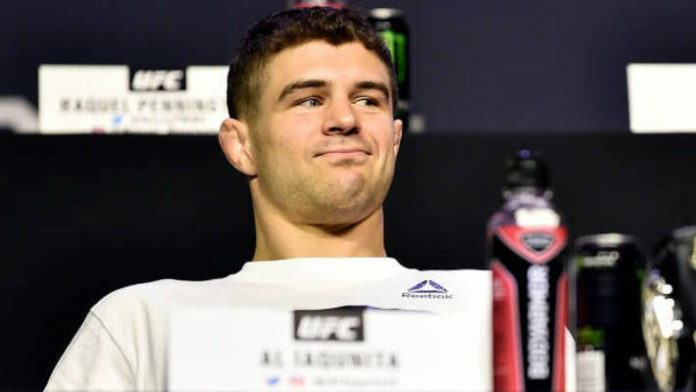 Iaquinta would confess that he had consumed four Indian Pale Ales before rendering that tweet to the public, hence the typo, but unless Iaquinta is a lightweight in more ways than one, he should be sober enough to be able to tell the difference between a UFC contract and a purchase agreement. If so, it would appear that Iaquinta has revealed that a fight between himself and Dustin Poirier has been offered. Dustin Poirier is on the record in stating that he wants either Tony Ferguson or Conor McGregor next if he is not receiving a title shot. With the submissions of both Khabib Nurmagomedov and Conor McGregor settled, it shouldn’t be long before the public begins to receive answers regarding the stacked lightweight division. Do you believe Dustin Poirier vs. Al Iaquinta is the fight to make right now?